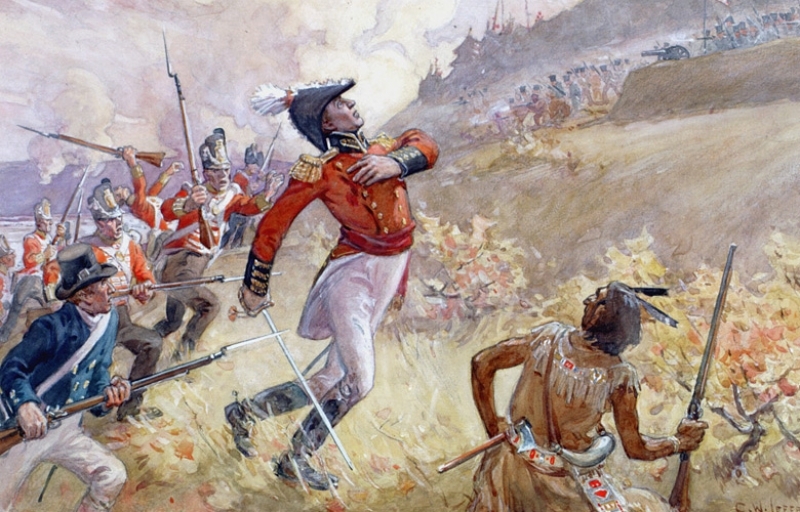 Outnumbered, and suffering the loss of their Commander early in the battle, the British forces and their Haudenosaunee allies managed to stave off an American invasion of Niagara in the Battle of Queenston Heights. 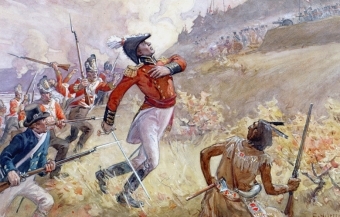 Outnumbered, and suffering the loss of their Commander early in the battle, the British forces and their Haudenosaunee allies managed to stave off an American invasion of Niagara. On October 13, 1812 the US launched an attack on the village of Queenston, hoping to capture the area and cut off British supply lines to the Detroit Frontier. The US forces attacked by crossing the violent Niagara River, only to get pinned down by Aboriginal forces. American reinforcements were reluctant to cross the river, and by this time more British troops had arrived to force the surrender of nearly 1000 US forces. Although only 28 British were killed in the assault, Sir Isaac Brock, the charismatic "Hero of Upper Canada" was one of those casualties. Despite the loss of a great commander, the battle did a great deal to foster morale in Upper Canada.